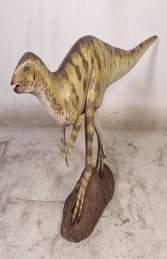 This Deinonychus with its unusually large, sickle-shaped talon on the second toe of each hind model is ideal for use with our other models in the dinosaur range to give a real pre-historic feel to any Jurassic display area. This amazing life-size Deinonychus model which lived during the early Cretaceous Period, about 115–108 million years ago, will make a huge impact and attract public attention in any themed Dinosaur area. It would be ideal to make the centre-piece of a pre-historic display with our range of large dinosaur models. It can be used in any themed area or in shops, businesses, pubs, restaurants, coffee shops, adventure golf courses, zoos, theme-parks or even in your own home. We do hold a number of our Dinosaur Series models in stock; however some, especially the very large figures, may have to be made to order with a lead-time of over 8 weeks, phone for details.